The Catholic Church didn’t re-emerge in Okehampton after the Reformation until the late 19th century, when the Military Camp was established on Dartmoor. 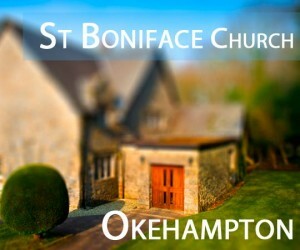 All denominations were now legally entitled to access to religious services, and a priest from St Boniface College in Plymouth was appointed as the visiting chaplain for Okehampton Camp. In 1905, he told the Bishop that people from the town were beginning to attend Mass at the camp but finding the climb up the considerable hill a problem, and were now asking for a church of their own. Permission was given, and a few energetic Catholics started fund-raising with the eventual purchase of a plot in lower Station Road (now identifiable as no.55). A metal building was put up in 1906 and officially blessed by the Bishop on 7th June 1907 as St Boniface Church. Later that year, Fr Francis Moulinet was appointed as the first resident Parish Priest. After 3 more priests had held brief tenure Fr Cyril Smith arrived, who had more ambitious plans for a bigger church and presbytery, a school-room and possibly even a Convent. The larger plot where we are now (just over an acre) was purchased in 1919, and by 1920 the new presbytery was being built. We think that our present Parish Hall is housed in the building intended as the school, but the big new church was never funded, so extensions to the hall of the presbytery on the south side allowed its conversion into a church, and this was later enlarged and an entrance porch added. Although the L-shape is not ideal, this has worked as our parish church now for over 90 years since the move up the road. The old church lower down the road was sold as a private house. These days, when the military are in residence they tend to come down to this church, as transport is readily available for them. Our Parish priest covers a large area, now extending east to the borders of Crediton parish, north towards Torrington, west to include Holsworthy and south to cover most of Dartmoor north of Tavistock.